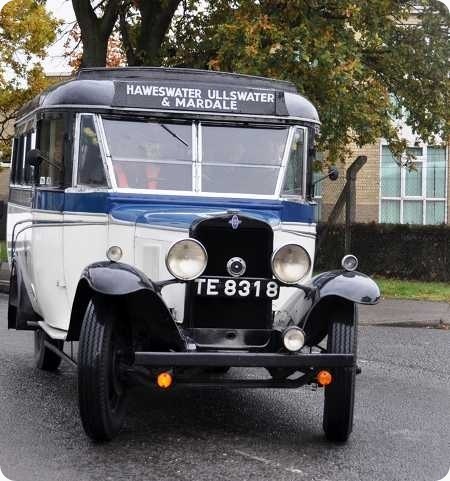 An American designed coach and the predecessor of the famous Bedford, this Chevrolet undertook daily tours during the summer season from Morecambe to the Lake District until the 1950’s. Operated by J Jardine as ‘White-Heather Lakeland Tours who also ran a taxi service in Morecambe. Interestingly, the Lincolnshire Vintage Vehicle Society who own the vehicle have located a note in the archives from the operator of the coach which states it has a Northern Counties of Wigan body. LVVS believe that TE 8318 has a Spicer body, although no body plate can be found on the vehicle, if anyone can solve this query I think LVVS would appreciate it. Although generally in the condition in which it was last used, the coach has been thoroughly serviced and an electrical overhaul has been carried out. The radiator, water pump and rear springs were re-conditioned in 2006/7 and the driver’s door step was replaced in 2007. On going work has been done every year to keep this vehicle on the road. The vehicle was built before agreement was introduced about the positioning of the pedals. Thus the middle pedal is the accelerator and the right hand pedal is the brake. Glad the driver knows which is which. Very nice, but then my schooldays were spent in Lancaster and British West Bradford, so I may be a bit biased! Branches of the Jardine family had other interests in the area, and anyone who remembers "Steamtown" at Carfnorth may recall a wagon painted in the livery of Jardine & Sons Crane Hire. The conflict of information is an interesting one. I’d have expected the current owners (LVVS) to have a good idea of the bodywork but, equally, I’d have expected the operator’s archives to be correct. I’m sure someone knows the truth and will enlighten us! There’s a bit in the biography of Douglas Bader which mentions his purchase of a car after the crash which caused amputation of his legs, and the pedals had to be changed over. The delivery driver said he’d crossed his legs, and that seemed to do the trick!